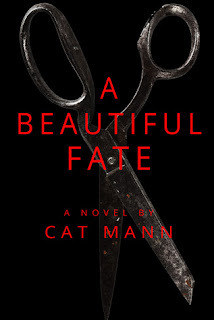 A Beautiful Fate was such a captivating and unique book. I loved the premise, and that Ava does not discover her history and gifts until the story is well established. I like it when I'm in the dark right along with the main character, and trying to figure out Ava's talents was intriguing for me. Ava is a strong and determined character, which always makes for a very satisfying YA novel. There's nothing I hate more than a weak-minded, indecisive main character who can't speak her mind or stand up for herself. Ava is none of those things, and I rejoiced in her strength. Ava has a lot of gumption and seeing her embrace her destiny was my favorite aspect of this book. There is a good-sized cast of characters in A Beautiful Fate, and each character was well-developed. I love that! Minor characters are the icing on the cake when it comes to novels and Mann does a great job establishing characters who are likable and each add to the story in their own way. As much as I loved the premise and characterization, I was not a big fan of Mann's writing style. The past and present tense were often mixed, and that made the book read awkwardly for me. Some of the dialogue didn't flow well, and I didnt' like how Ava was called "Ava Baby" by some of the characters. That term of endearment felt forced to me. In the end, these issues were overshadowed by how much I liked the story and the characters. A Beautiful Fate is a pretty long book, which allowed for a lot of action to the plot, as well as plenty of character growth. I loved the chemistry between Ava and Ari, and also the slow development to their relationship. They start out as friends, which always makes the relationship feel very stable and grounded. There was a pretty big surprise at the end of the book, which took the story in a direction I wasn't expecting. I'm really looking forward to the next book in the series, A Broken Fate. Doesn't sound right for me but I loved your review. Sounds a bit spooky.